State College Friends School has been recognized by The National Wildlife Federation (NWF) as a school with Wildlife Habitat Gardens that support birds, butterflies, bees, frogs and other local wildlife. Our Certified Wildlife Habitat gardens provide natural sources of food, water, cover and places to raise young and is maintained in a sustainable way that incorporates native plants, conserves water and doesn’t rely on pesticides. Students, teachers, and volunteers have planted and tend to several specific garden areas on the school grounds as a demonstration of love for nature and commitment to stewardship. According to the NWF every Certified Wildlife Habitat garden is now also part of the Million Pollinator Garden Challenge, a national effort to create a million gardens that provide habitat for declining pollinator insects such butterflies and bees. Participants who have their wildlife habitat garden certified receive a personalized certificate with a unique habitat number, a one-year membership to NWF with a subscription to National Wildlife magazine, a subscription to t he Garden for Wildlife e-newsletter, a 10 percent discount to National Wildlife catalog, and the exclusive right to post a Certified Wildlife Habitat yard sign. Friends School will install the recognition sign during our April Earth Day all-school activities. 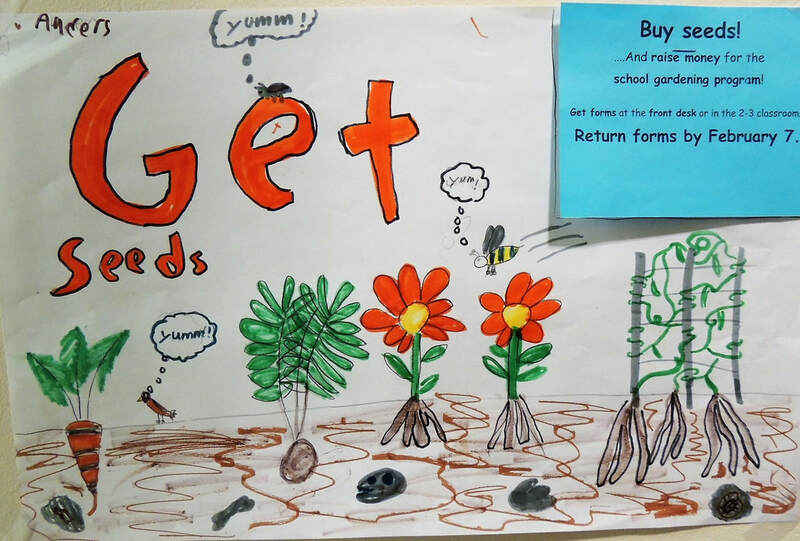 Students in K-4th grade at Friends School will have an opportunity on Friday afternoons to discover new interests, participate in community-building activities, deepen their knowledge in a favorite subject area, and/or develop a new hobby through a new program directed by Karen Maynard. Karen will work with teachers, staff, community members, parents, and most importantly - students, to craft a rich mosaic of programming to enhance the Friends School curriculum. Karen is a Penn State graduate with a B.S. in Childhood Education and a minor in Human Development and Family Studies. She has served as a Friends School Summer Camp co-director and counselor, and most recently taught at the Bennett Family Center at Penn State. In addition to her new role as enrichment leader, Karen will be the teaching assistant for the 2/3 classrooms. With a background in music and dance, and a deep interest in handicrafts, nature, and learning new things, Karen will bring creativity, experience, and passion for working with children to Friends School. "Once students have an opportunity to settle in to the new school year, we'll start the Friday Afternoon Enrichment Program with a series of multi-age activities to build our own school community," said Karen, when asked to describe her ideas for roll out of the new initiative. These activities will include ice-breaker and team-building games, team-work challenges, and a local field trip. "Faculty, staff, and parents have offered so many ideas for rich programming throughout the year -- from photography and journaling to rocket science, drumming, rock collecting, financial literacy . . . the list goes on," said Karen with a big, bright smile. Head of School Donnan Stoicovy and other staff say they are eager to hear from students about which avenues to pursue to satisfy their interests. "We have the scaffolding in place for this new venture, a solid idea of what our schedule will look like, and a terrific leader to organize and grow the program," said Donnan. "Now we just need to start school!" Earlier this summer, State College Friends School made the difficult decision to close Friends Schoolhouse on E. Prospect Avenue. Just two weeks ago, Friends Schoolhouse Teachers Deb and Migelle put the finishing touches on the new Pre-K classroom at University Drive. "This is a really exciting time for our K/1 students who are eager to meet and help their new younger friends," said Lisa Gamble, associate head of school. From the youngest students to those about to graduate, this expression of affection and friendship has been one of the hallmarks of the school. Multi-age classrooms and a school that encourages student-to-student mentoring create a nurturing environment for our new friends. Friends School can now offer families a pre-kindergarten option, as well as a K/1 option. Associate Head of School, Lisa Gamble is highly experienced in helping to determine the best placement for children. As a child-centered independent school, we look at the whole child as we determine their best placement; the social and emotional skills of a young student often being the most important developmental characteristics to determine readiness. 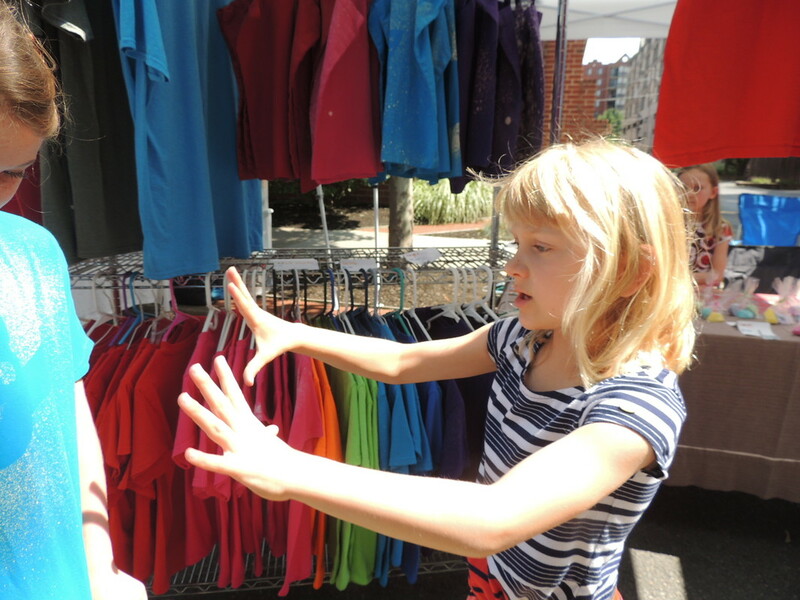 A number of Friends School summer campers, students and alums were present at the downtown Central Pennsylvania Festival of the Arts on Children's Day. The campers were participating in activities on the lawn of Old Main, where face painting was one of the most popular activities. Several students and alumni were set up for exhibition and sale of their work. 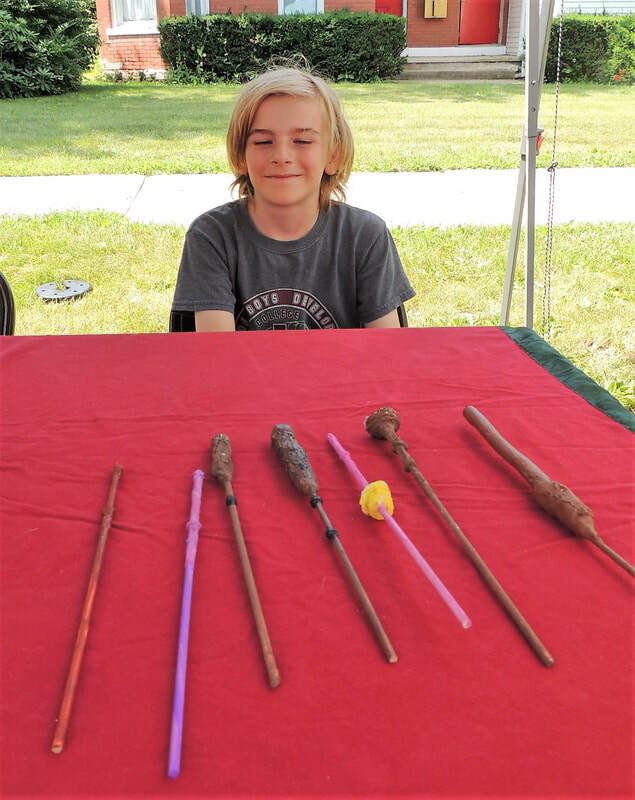 Rising fourth grader Liam had a draw for window shoppers: "Sure, you can try the wands and pick them up." The enterprising-crafter made no claims or guarantees about the efficacy of his hand-crafted wands made with wood and other found and recycled materials. The lack of promise didn't seem to deter would-be buyers. Unfortunately, Liam blinked at the snap of the photo below. Perhaps that blink was a cover to hide the twinkle of magic in his eye as he described the potential of the Potter-like wands to curious customers. By festivals end, Liam sold out! Mattie got busy right after graduation in June, building her varied stock for this year's festival. 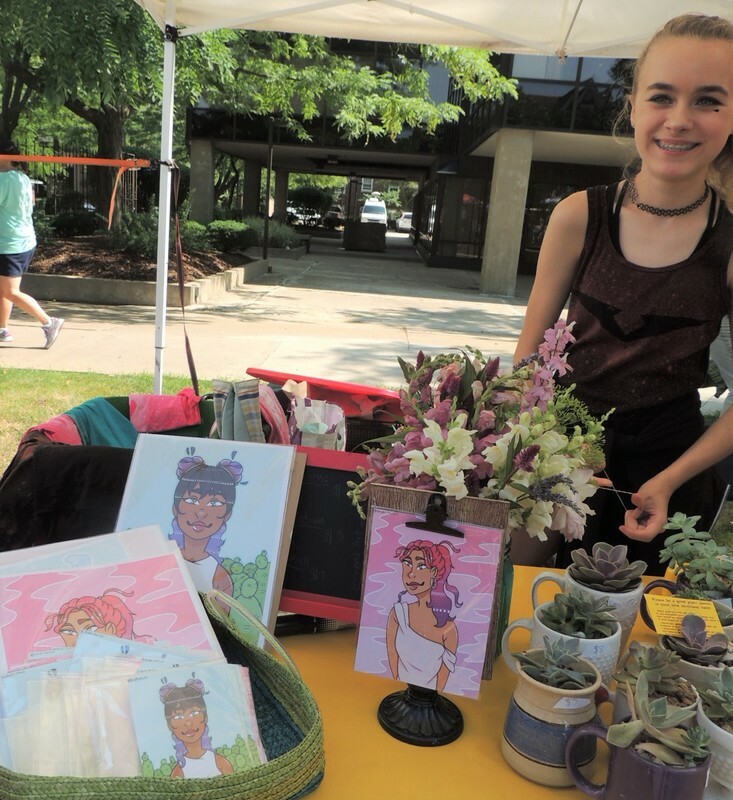 She returned to the youth sidewalk sales this year with her popular stencil T's and succulent gardens; and added a collection of original art. Mattie's creativity and success in past years served as inspiration for a trio of younger students who created their own variation of T-shirts to go along with their hand-poured scented glycerin soaps. Rising first grade student Camille (below), practices some amazing customer service skills in describing the way the T-shirts were designed. (Not pictured, but equally engaged: partners Clarisse and Arden, both entering third grade). 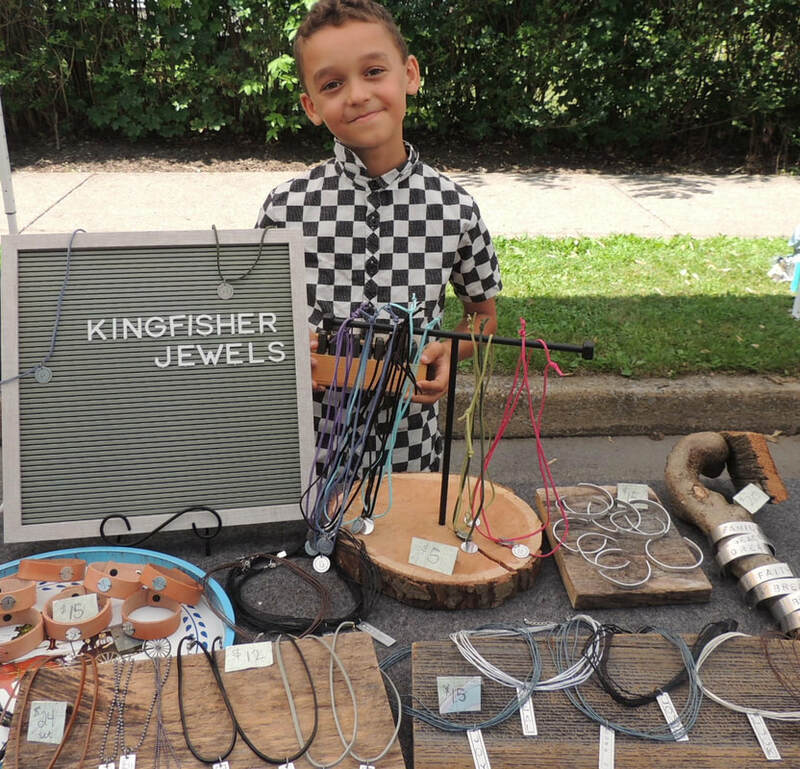 Friends School alum Sergio named his new jewelry collection after a Kingfisher seen in his backyard. With inspiration from his mom, who has made and sold jewelry, he settled on the idea of leather cuffs, charms, and pendants, stamped with initials and affirming words like hope, sing, free, kind . . . The stamps he used were on display in a wooden box with a patina that looked as if they were from the distant past. It turns out hey belonged to his great-grandfather. Perhaps that's why the new jewelry looked like it came from the hands of a wise, experienced crafter. State College Friends School is very pleased to announce that Donnan Stoicovy has been hired as Interim Head of School for the 2018-2019 academic year. Donnan will oversee all aspects of administration while the school completes a national search for a permanent head. Stoicovy, who retired in 2016, served as principal at Park Forest Elementary School in State College for more than 27 years. In that position, she was instrumental in cultivating a safe and rich learning environment designed to empower thoughtful, active, and engaged citizens. Under her leadership, Park Forest Elementary enjoyed recognition for environmental education and for an award-winning recycling/zero waste program. At Friends School, Stoicovy will fill the position recently vacated by Dan Hendey, who pursues new career opportunities after nearly eighteen years of service. Hendey began his tenure at the school as a teacher and helped start the middle school program at Friends. Subsequently, he served as business manager for several years before becoming Head of School. As head, he was instrumental in making improvements to playgrounds and facilities as well as the curriculum. In 2010, Hendey added Pre-K to the school’s offerings, and prior to his departure, he facilitated the relocation of that offsite program to the school grounds at 1900 University Drive, where a PreK-4/K classroom will open this fall. Following their speeches and the presentation of gifts and diplomas from faculty and staff, eight middle-school students pulled the strings of their confetti poppers amid joyous applause from the audience. These young, bright students are off to enjoy a summer of family fun before embarking on their journey through high school. Thank you to Elizabeth Pennock and Rene Witzke for sharing photos of this special day at Friends School. At the close of the 36-hour online giving event, Centre Gives, State College Friends School had raised $17,100. Thank you to all who contributed to the Centre Foundation event.